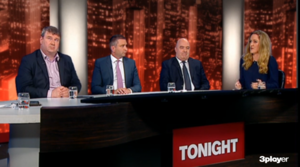 On Tonight with Vincent Browne, hosted by Matt Cooper, the panel discussed the payments made to Console CEO Paul Kelly, his wife Patricia and son Tim – as recently reported by RTE Investigates. 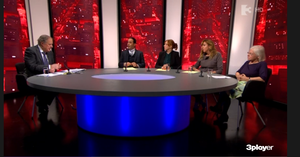 The panel included Fine Gael Senator Michael Conway, Fianna Fáil TD Niall Collins; interim CEO of Console David Hall; and columnist with the Irish Independent Colette Browne. 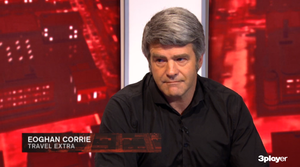 Posted in Misc and tagged console, David Hall, Matt Cooper, Tonight with Vincent Browne at 2:19 pm on July 1, 2016 by Broadsheet. This is laughable if you know anything about David Hall and the charity he founded in his early 20s. David Hall is interim CEO? You have to laugh, you really do. Laugh? No, not at all. What ye mean another scandal. Charities, shrr was that not in the news about a year ago, with a scandal back then about the central remedial clinic and others. Screaming in the suffering seas etc. Fraud/white collar cases take a bit longer to put together. Especially when we totally underfund and under-resource the departments. If the social welfare suspect that your claim is in any way dodgy, they immediately suspend payment and do not recommence until they have invesitgated to their satisfaction that all is OK. But it’s OK to keep barrelling money to this scr*te until the report has been changed to status “final”. One rule for the unemployed and another rule for ball bags. He is being asked to give back his People of the Year award, that ought to teach him a lesson. It’s awful though.. all you can do is laugh. That’ll be about the extent of any punishment he’ll receive. Paul Kelly no longer has access to the console’s accounts or assets. His whereabouts is unknown. Next he will be running for the dail. the ninth version of the report! lol! The length the establishment in Ireland will go to cover stuff up or make it go away! Well I don’t know, I just see Hall saying that it was version 9. I regularly write documents that go up to v0.9 before they’re released. Maybe it’s just that there were 9 versions saved and somebody was doing some basic version control, rather than that they published 9 reports before he saw one. i dont think tis that simple like and edit of a typo here and there. Essentially they wrote the report and someone higher up told them to water down sections and bury other stuff. Thats the jist im taking away here. ie. to deflect away any responsibility the HSE has over tax payers money they gave to this fraudster. I see your point LW re: the qualifying statement. … I would say we need competent CEOs to run charities, to take care of the business- end of providing services, but we also need people to promote and raise the profile of the particular cause. We would also like more stringent regulation and resources to root-out fraud and hopefully discourage people like Paul Kelly. a) Other than general audits it is hard to unpick clever accounting. Without a whistle-blower it is hard to justify selecting a particular individual or organisation for scrutiny. Apparently there was a whistle-blower in this case and a past conviction for fraud yet we also want to give people a chance to redeem themselves and maybe the HSE were being extra careful; careless investigation and incorrect findings might damage a genuine person’s reputation. b) I’ve heard the following complaint in relation to government and EU regulations: that intricate paperwork and detailed conditions that give a fair and neutral assessment and that would expose wrongdoing or fraud also serve to penalise those in small organisations and businesses that don’t have the range of expertise and specific people to deal with “red-tape”. It’s a tricky balance and I think it has been largely neglected or ignored with respect to charities and now we see how the goodwill and desire to help have been abused. I suppose I do have issue with some people, like I sometimes do*, who immediately jump to the conclusion that “they” are all corrupt and self-serving because of the actions of a few. *It’s very difficult to see cases like this, again and again, with no follow-up like a general audit and investigation of the sector to restore confidence. It’s difficult when you walk out of a shop or a supermarket and the chuggers are there, and they look directly at you, and say ‘support such and such please’… And you give them a few bob and they’re like ‘ah bless you dear, there’s a place in heaven for you’. It’s an Irish guilt thing.. they’re hard to walk past and ignore. Is it true that he hasn’t broken any laws, that all the details people are talking about only relate to company law and don’t apply to charities? Who would ehh ever have ehh, guessed that there would be so many, quote charities in Ireland. The motto being, ehh, give a little and take, quite a lot actually. As some of charities, say, quote, charity begins at home, it sure does. version 1 and version 9 of the Report.